These four photos are provided in high resolution so they will print out to fit an 8-1/2 x 11 sheet. 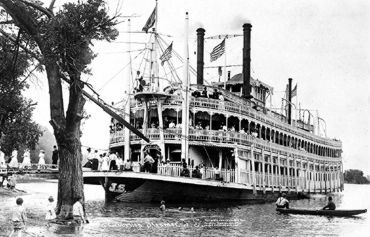 These photos represent a variety of paddlewheel boats from different historical periods. Click for a high resolution, printable version. Top Left The Henry Lourey is listed in Way's Steam Towboat Directory as follows: Built Mound City, IL in 1881; dismantled Elizabeth, PA June 1911. This photo is the right eye view (best of the two images) from a Keystone View Company stereo V18450; obviously on the St. Louis levee. 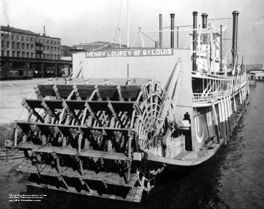 According to http://freepages.history.rootsweb.com: This photo of the Steamer HENRY LOUREY was taken prior to her being sold to the Pittsburgh Combine in 1904 from St. Louis. Top Right La Crosse is a plain boat with no gingerbread, or decoration. Note the minimal detail on the lamp housing and pilot house interior. The detail is so telling and the way the people are captured unselfconsciously is like a stolen moment from the past. There's a pathos in the picture from it's back to the basics simplicity. The image is reminecent of John Steinbeck's novels with picturesque settings and raw characters. The Fred Way directory says the boat was built in 1889 as the Ravenna, a rafter. Renamed La Crosse around 1900 and ran La Crosse-Wabasha trade among other gigs. Lost in ice Randolph, TN. June 31, 1918. Dave Thomson said, "This is one of my earliest acquisitions and it's always held a special fascination for me. What a little sweetheart she was." Nori Muster comments: "It looks like a steamboat built by the Bauhaus." Lower Left The J.S. This postcard bears a postmark in Edelstein, IL, June 18, 1910, the same year the boat would be destroyed by fire. The disaster happened at Bad Axe Island en route from Lansing, Iowa to La Crosse Wisconsin. Dave Thomson provides this image as an example of a boat with plenty of gingerbread. The J.S. is one of the Streckfus boats. For more info. go to The Strekfus Exhibit at this site. 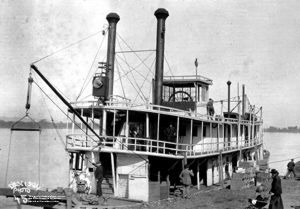 Lower Right Red Wing - This is an example of a very early steamboat. The flags and tall stacks made it almost fanciful, as if a Hollywood art director had gone overboard reimagining the past. But it's TRUE, all true. 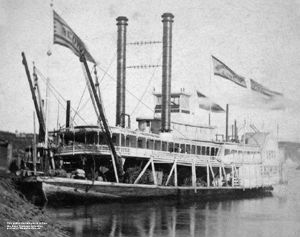 According to Fred Way, this boat was built for the Keokuk Northern Line in 1870, running between St. Paul and St. Louis. Dismantled 1882.